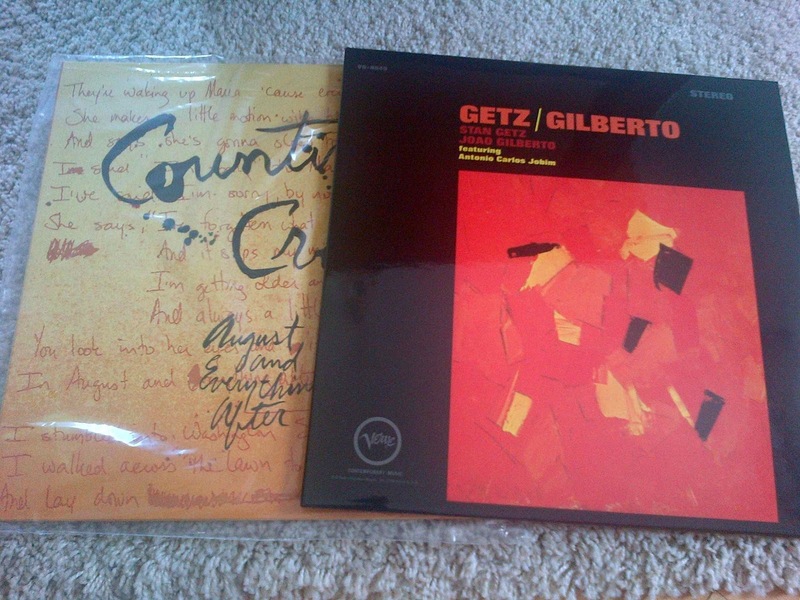 Chad Kassem of Acoustic Sounds sent in two of his latest releases QRP Stan Getz & Joao Gilberto - Getz and Gilberto and Counting Crows - August And Everything After vinyls. Both have gone through a full analog chain and are pressed on 45 rpm. A lot of positives to start a review. Getz Gilberto needs no introduction. This is for sure one of my desert island discs to take and among my favourite all time albums. The quiet revolution that Bossa-nova movement started is hardly better represented then with this legendary album and team of musicians. Everything around this album breathes with a certain vibe and aura. It always transfer me into the southern hemisphere mood that slows down the current life's fast forward rhythm. Soothing music of syncopated drums stops the flickering mind and lets me crawl into the musical universe of Like with his protégée Michel Franks, he have invisible power to drag you into the life's energy and reminds you to cherish those little things that enrich our time on this planet. For this album every note struck seem to be spot on. The Music just moves without border. We're all accustomed to recognizable Verve's sound. Warm, lush, a bit overblown tubish sound, that adds a certain signature to the Getz and Gilberto LP. Chad Kassem's efforts with his QRP (Quality Record Pressings) goes beyond simple vinyl revival. His passion for analog started up a complete new venture of his own pressing plant and series of rereleases. In the era where digital seems to penetrate every inch of our lives I cannot more wholeheartedly embrace his quest and venture. "The original master tapes for this title had not been used since 1980 previous to this reissue. Also, for this Analogue Productions reissue the decision was made to master and present this album as it was originally mixed to master tape. With very few exceptions all versions of this title to date, including the original, have had the channels incorrectly reversed. With this version, you'll hear this title as it was intended to be heard, without the channels reversed. And again, those reissues you've heard up until now - definitely still breathy, warm and rich - were made from something less than the master. Prepare to hear the veil removed." (AAPP 824-45) this is as good as it gets, without having the real master tapes on your hand. It's a celebration of analog. Being (a) complete transformation of the sound and album in general this vinyl feels like another fresh release. If I would have to sum the overall feeling of this new Chad LP, then I would call it soulful. Everything is even more subtle and present. Astrud's vocals finally got the needed three dimensionality and "spirit" and Getz's saxophone breathes out of proportion. When compared to other pressings for example Astrud is a mere statute (statue). Here she came alive and with the feeling of a real life size. Recognized tube like and even muffled sound of the double bass is now gone. It's still holding the round nature, but its now more defined and less boomy. The whole presentation feels like a complete efffort joined into a musical event for the connoisseurs. With 45rpm benefits the album gained better transients and a sense of atmosphere. It moves you more intimately and straight to the core. As for many August And Everything After is my favourite Counting Crows album. It could be a generation thing and not only a "Mr. Jones" hit single impact. It's true, that this track spin brought the band glory and recognition to the stratosphere, but that's not merely it. The whole album is a celebration of refined producing and musicianship. T-Bone Burnett's feeling is unprecedented. He's got a feeling to bring the best out of people and produce albums of legendary status. After was released August And Everything it became an multi-platinum seller due, but not only to success of hit single "Mr. Jones." We might be accustomed to the CD sound of the album as it was mastered as such, but thanks God to Chad's persistence of seeking out the releases with analog session tapes what we have here is a new true analog jewel recording being pressed. "We were fortunate that this was recorded to analog in an age that had many digital recordings," says Acoustic Sounds founder and CEO Chad Kassem, who describes August and Everything After as "one of the better albums in the entire '90s," with a timeless vibe and classic pop sound. Although recorded to audio tape, the album was originally mastered for CD and featured a longer playing time than a standard LP. Thus Analogue Productions has reissued August and Everything After as a double LP set to maximize the dynamic range of this recording. This is the first time that the 'Crows multi-platinum smash has been released in the U.S. as an LP. Mastered by Ryan Smith at Sterling Sound." This is how rock music should sound like and how you should experience it. With full impact and glory of the medium. Do not miss Counting Crows it sets a milestone that sets a bar so high for decades to come. Both musically and production wise. Analog was and still is the preferred medium not only for my late night listening pleasure, but for my critical listening of gear to test and review. This feels like an art. Dead quiet vinyl, clean and clear pressing, with right pace, expertly mastered Mastered by George Marino and Ryan Smith at Sterling Sound. Like with best wine, hand rolled chocolates from finest Peru cocoa that you treat yourself once per month or even a year these two releases feels exactly extraordinary. They are not just an audiophile embracing albums, but a true joy for any music lover and analog fan. A clear recommendation and both albums received the Mono & Stereo Strictly Vinyl Analog award. Thanks Chad! Matej Isak. Mono and Stereo ultra high end audio magazine. All rights reserved. 2006-2013. www.monoandstereo.com. ..:: None of the original text, pictures, that were taken by me, links or my original files can be re-printed or used in any way without prior permission! ::..